What are the types of Rocket Missles? 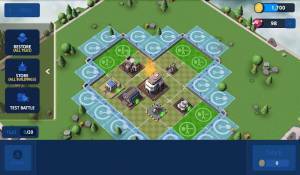 Mad Rocket Fog of War is a free-to-play base building strategy game where the objective is to raid your opponents base for the resources, gold, eternium, cube.. This is not as simple as it sounds though as their base will be covered in a thick layer of fog which will prevent you seeing the layout of it. This then makes it difficult to choose the optimal strategy to attack it, and to make matters more difficult you are also up against the clock. In order to win the battle you have to earn at least 1-star in the given time, this can be achieved by destroying your opponents HQ. The units in your team assenbled to carry out the assault on your opponents base each have their own special skills and your job is to make sure you select the right units in order to reveal and enter the enemy base with minimal casualties. Although as the game progresses you will be able to unlock new and more powerful weapons to make your task easier you will discover that your opponent can also do the same. There are two gameplay mechanics that make Mad Rocket Fog of War unique when compared to other games in the genre. One of those mechanics is creating a labyrinth out of your buildings which is capable of keeping your foes invading force at bay while at the same time successfully keeping your important resources intact and the other is not knowing the layout of the enemy base because it is covered by a layer of fog. Your first priority is to make sure you build enough storage buildings to store enough Eternium for your next HQ upgrade. It is important that you make sure that these buildings are heavily defended to keep the Eternium safe. This will mean that you need to keeping your defenses on the max level that your HQ allows. You can help avoid being raided when you leave a session for the day by spending as much Gold and Eternium as possible. Basically the more resources you have the more attractive your base will be to other players to invade. Even if you can't upgrade units you can still upgrade your mines since they are the only constructions capable of upgrading with Gold. The ideal situation is to leave the game with less than 1,000 Gold and your Eternium in storage. As you cannot see the layout of your opponents base as it is shrouded in darkness from the thick layer of fog finding the ideal landing spot for your invasion is much harder than in other similar strategy games. If you include multi-rockets in your invading arsenal you will be able to recon the enemy base quickly and thoroughly without sacrificing your troops. Look for a blind spot that is near a resource you are after or near the enemy HQ. If you win at least 5 Multiplayer matches a day you will earn free Gems by claiming the victory bonus. After you have been defeated check out the Battle Logs at the main screen to replay the match video and learn where you went wrong so you can make the necessary adjustments in your gameplan to avoid getting beat that way again. No discussions open for Mad Rocket: Fog of War at the moment.